Monitoring websites to track success of a business is a culture and has since become a practice. It is usually interpreted that if the graph is good, the business is on the road to success and this somehow leads to significant aspects being neglected. Now, you must be wondering why so? This is a fact though, that simply by analysing your website, you might just never able to reach potential leads or evaluate the conversion rate of your potential customers or maybe even understand what is actually desired of your product to fulfil the demands of the market. Marketing analytics fills in the blank here, and is the answer to all the forecasting you have been doing till date based on the evidences only. Implementing marketing analytics is what is to be learnt now. When it comes to analytics there are people who will behave as if it doesn’t matter. But it sure does. Smart people across the globe are investing in this science so as to improve campaigns and gain insights. 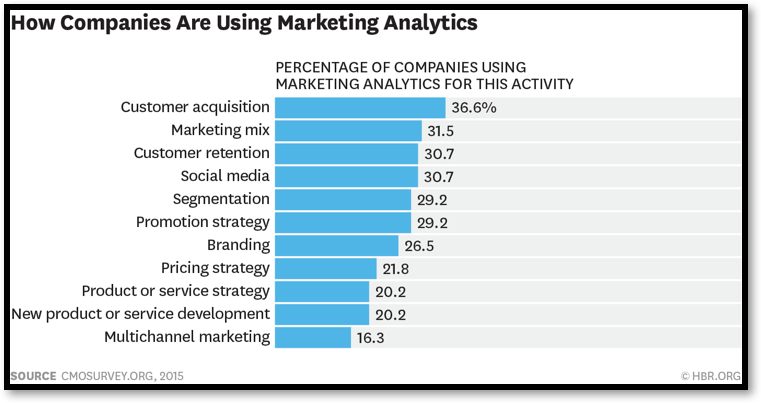 A data from HBR (2015) shows various ways in which marketing analytics is being used by different companies. 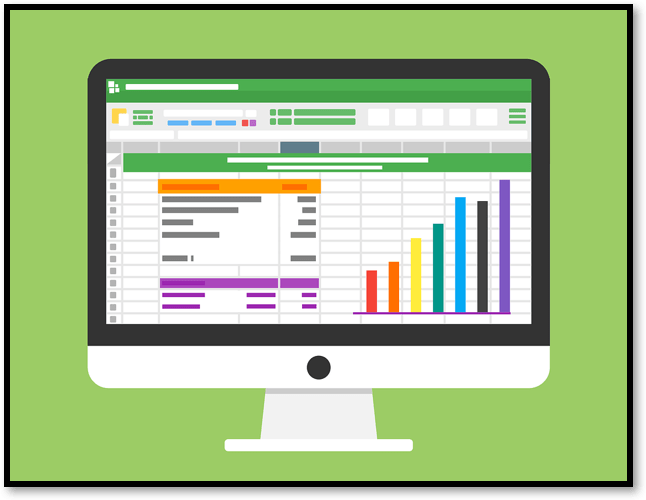 Given the importance of marketing analytics for a business growth, let me take you through it so we can see if it actually does matter to make it a part of your everyday business operations. Segmentation models – Algorithms for grouping customers on basis of factors like, the type of products they buy or the amount of money they spend etc. Prediction models – Insights like customer conversion ratio (the number of people who visited the website to the ones who got influenced by the marketing campaign and bought products from the company), the likelihood of engagement, propensity to churn, the probability to buy etc. are derived from these models. Prediction models build on customer analytics can make a significant impact to any business. Recommendation models– Offering recommendations about the product that the customers may like depending upon their previous purchases. All these models collectively utilize all the data from the present as well as the past and transform it into useful insights allowing business to improve in lucrative terms like sales and the RoI (return on investment). Ranking your leads based on the likelihood of the actions they might end up taking is another front marketing analytics could help you peep into. This further assists in identifying prospects with similar attributes. The leads thus generated become prospects that can be turned into permanent customers. In this scenario, it is important to consider that, to generate optimum results a large number of data sets are needed. This gives bigger firms an edge over the ones that might not own such huge data quantities, by improving their RoI return on investment. But with the right approach and help, smaller industries may also be able to gain this insight as per their needs. To launch a product that will suit the present demands and patterns of the market, a deep and well predicted insight is a must. Again, marketing analytics is the answer here, the predictive algorithms allow the companies to improve the new product based on customer data piled up while taking sales and feedbacks into consideration. All these factors integrate to form a part of the bigger marketing strategy and allow the business to enhance their earnings. We all are proof that marketing campaigns via emails or social media allow the firms to improve their customer base. Marketing analytics gives companies the power to monitor and optimize these campaigns so that the sales and ROI can see a growth. The integrated tools and techniques help rule out the lacuna that might hamper the campaigns and their implementation as decided. Also, it becomes possible to monitor the current outcome of any campaign, whether it works properly or needs to be altered for the future. A company may find out that digital, print, TV and radio marketing takes up around 85% of its market spending. Now amongst these many of the activities can be directly measured but spending on digital marketing can be refined using marketing analytics tools. The company can then use the results to optimize their strategy. Using these types of approaches allows the marketers to track marketing performance on a real-time marketing analytics metrics and take wiser decisions for its better implementation. Which marketing efforts are experiencing stable growth? Which marketing analytics metrics need to be monitored? Which channel is returning the most feedback? Which channels are the least intensive but ROI positive? Which channels must be tracked to understand their return? Which channels might be a short-term loss, but a long-term gain? Which channels are affecting other channel’s growth? Marketing is an integral part of a business and marketing analytics offers profound insights into customer preferences and trends. Despite these advantages, a majority of organizations fail to realize its importance. In a survey conducted by senior marketing executives in Harvard Business Review, it was found that more than 80 per cent of the business owners were not satisfied with their ability to measure the marketing ROI. In such scenarios, it becomes important that marketing analytics be incorporated into the business module and brought into practice every day. The decision makers might make it a habit to let their data do the talking, and to understand what your data speaks, you definitely must bank on efficient data science partners. Thanks for the kind words. Hope you like the content as well. We are constantly trying to provide one of the best Data science content for our readers. Happy Reading !! !